......I have heard this from the Chief for years. The Chief's daddy was murdered when he was only 10 years old. Throughout the years I have learned about the extreme harshness inflicted upon the Chief and his brother's, coupled with all the great memories the Chief has of his Daddy. One thing that is a constant in talking with the Chief and other family members is that someone always seems to mention the hat. I always asked, "Where is the hat? What happened to it?" 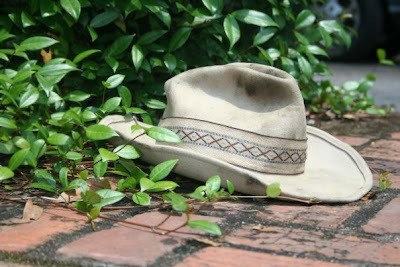 I learned that the hat was taken by a family member after the Chief's daddy died and was buried. Later I would learn that it was just sitting in a garbage bag for 26 years or more shoved into a closet. We have know for years that this family member lives a county away from where we live now, so last Summer we took a trip over to see her. This was the Chief's aunt (his daddy's sister). We had a great visit, although I was GREAT with child and miserable, I loved listening to the Chief go down memory lane (good and bad) as we got closer to our destination. Quite a few months went by, actually 5 months rolled by and the Chief's birthday was approaching. I was doing dishes one day, and had a thought come to me....."it never hurts to ask" I thought, I wonder if anyone has ever just "asked" Aunt Mary Alice for the hat? I learned a LONG time ago the worst someone could ever say to you when you ask for something is NO. So with a little scheming (I had to get her # from the Chief's phone) I called and asked. Without a moments hesitation the reply was, "If I can find it, you can have it." Scuse' me? What was that? For real?....now weeks pasted and I hadn't heard anything and I was getting worried, I finally got a call, "I am so sorry, I have searched hi and low and I just can not find it." I was a bucket of tears, I was so sad...so I started praying. "Lord, help me honor my husband, with this gift. Help me please to show him my love by working this out. Please find that hat for me." Two days later and 1 week before the Chief's birthday I got the call. "I have found it." I will bring it to you. So with the Lords help I was able to be there to watch the Chief receive his Daddy's hat, his daddy's hat with greased finger prints on it, his daddy's hat with his daddy's hair still on the inside, the hat his daddy last wore. A hat the Chief will pass down to our sons and hopefully their sons. 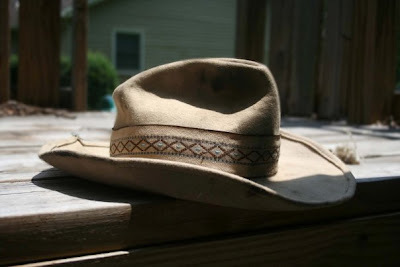 A hat that in a memory filled with sad and horrific things brings the "good" memories to my husbands mind. A hat the Chief had not seen in 26 years. I have never seen my husband at a loss for anything. There were no words...he was in awe that in his hands he was holding his daddy's hat. I am honored to be a part of watching him get the hat, I am grateful that I was listening when the Holy Spirit whispered " It never hurts to ask." .....is full to say the least. I thought Summer vacation would be filled with lazy days and such. Ha! No such luck. I am still keeping my two "other" babies three days a week for the Summer. We are busy. Last week I found a VBS that was in the morning time and the Doodlebug's had an absolute blast. The one that was fun to watch was DB #4, he FINALLY got to go and hung strong throughout the whole week. The people that are painting our house (inside) started bringing their grand-daughter, so most days I took 7 kids to VBS, and had 8 here in the afternoons....CRAZY! The Chief and I are planning a mini vacation, because of $$ we are going to have a "pretend" vacation and stay at home. Hopefully people will leave us alone for a week. We are going to have to hide our cars (and no I am NOT joking). Because of the Chief's position people are dropping by our house all the time, weather he is working or not. Some people think he is available 24, 7 days a week. We are planning several day trips here and there. Hopefully we will make it to the beach for at least a day trip. Oh, how I wish we had the $$ to stay a week at the beach somewhere. Would you believe me if I told you we will be married for 10 years in Dec. and have NEVER been on a "real" vacation. No I am not joking. I am looking forward to just being with my husband and doodlebug's for a solid week, no cell phone, no computer (maybe just a little check in now and then) and no where to be, kids to watch (cept, my own)....I will choose to be grateful we are getting to do this if nothing else. Have I mentioned lately, that the Chief works two near bout full time jobs. By fault the Chief is a work-a-holic however I miss him. I miss him when three or four days go by and I don't see him. To this day (other than my daddy) I do not know a man that works as hard as the Chief does. Chief's profession does not afford us a lavish lifestyle, infact, you would seize up if you knew what we manage to live on.... he is my provider and protector and I love him with all I have because of his dedication to his family. So we will enjoy every moment of our "fake" vacation here at Casa Da La Jenkins...how is your Summer going? My Beeba and my PawPaw came for a (too) short visit on Sunday afternoon. Now these are my Daddy's parents and the ONLY set of living Great Grandparents on either side that the Doodelbug's have. All morning we prepared for them to come and the DB's were all outside waiting for the arrival when the van pulled up caring 4 very special people (my mom and daddy came too). We had a GREAT, energized visit and it ended all too quickly. Thank you Beeba and PawPaw for coming to see us and for loving us so dearly. We love you and miss you already....the Doodlebugs sure do too! I love you my Beeba and PawPaw with all that I have.